It turns out that axe throwing is the new darts. It has emerged as a nationwide trend that some enthusiasts hope will take off the way bowling did in the last century. People seem to enjoy it as a fun activity to unwind after work and celebrities are also getting in on the fun. Jimmy Fallon even publicly challenged Serena Williams to a bout of axe throwing on The Tonight Show (technically, he won although her last shot packed a punch). When an episode of Real Housewives of New Jersey aired featuring the cast at an axe-throwing bar, clearly the sport had made it into the mainstream. In axe throwing, it’s best to start with a small hatchet. They are lightweight, easier to throw and therefore better for a beginner. When starting a business, you want to start small and not take on more than you can handle. In Jim Price’s book, Launch Lens: 20 Questions Every Entrepreneur Should Ask, he delves into the concept of starting small and focused and then later expanding to achieve a bigger dream. Look at Amazon. Jeff Bezos started small by selling just books and after a year, broadened his product offering. Now, according to analysts, Amazon is on pace to capture 9.6% of retail sales by 2020. Then there’s Starbucks. Starbucks was started back in 1971 by three former University of San Francisco students. They began selling premium coffee beans and later expanded to sell pre-made coffee, tea and espresso. Now Starbucks’ current revenues reach nearly $15 billion worldwide. Finally, there’s Dell. Michael Dell started by selling computer parts out of his University of Texas dorm room. Within three years after he left college, the company was worth more than $100 million. Dell started with PCs and has now expanded to several major industries including enterprise solutions for cloud computing and IT security. Lesson: start small but think big. Axe throwing isn’t much fun if you don’t have a target. When starting a business, you need to understand who your target audience is. Having a clear vision of your customer base will increase your chances of success. This knowledge will influence every aspect of the business including product development, content and sales. It will also allow you to craft your marketing message appropriately using the right tone and language to appeal to your prospects. Many new entrepreneurs make the mistake of wanting to serve everyone. Defining a target market won’t limit your business, it will increase cost efficiency. You’ll know exactly where to find your customers rather than wasting time and money on marketing your products and services to a broad audience. Lesson: focus your marketing efforts on potential customers who are likely to buy your product or service. Once you have your axe in hand and are ready to throw, you need to lean in towards the target and follow through. Lesson: success comes from committing yourself fully and executing effectively. Knowing when to let go of the axe is essential when developing your technique so you can eventually hit that bullseye. Lesson: when it’s time to grow, consider letting go. After the first few throws, continue to adjust so you can perfect your technique and develop consistency over time. Lesson: starting a business requires the ability to test, learn and adapt. In axe throwing, you can’t get frustrated when it seems hard at first. Just like any sport, it takes practice. Starting a business requires patience. The irony is that most entrepreneurs are impatient. Patience can be learned over time and frankly is a necessity because starting a business is difficult. There are many ups and downs, and it’s only your diligence, persistence and passion for the work itself that will get you through those rough spots. Lesson: all good things take time—have patience and success will come. 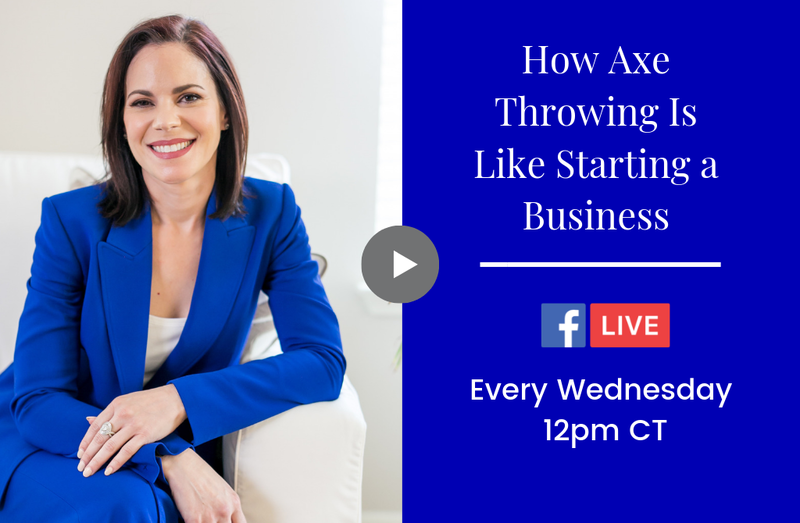 So next time you find yourself at that after-work axe-throwing party, consider how much better prepared you will be to start a business!